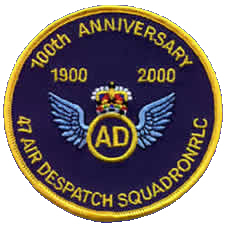 There is now only one Air Despatch Unit in the British Army, 47 Air Despatch Squadron RLC (Royal Logistic Corps). Air Despatchers have served world-wide on training, operations and famine relief duties. They were easily distinguishable from other units as they always wore their own Formation Sign wherever they were in the world — a golden Dakota on a Royal Blue background. 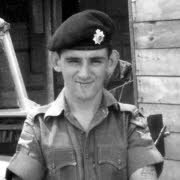 LEFT: Dvr ‘Taff’ Bowen in Sarawak. 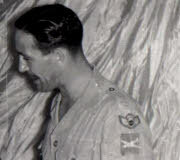 RIGHT: Sgt Alex Cairns in Aden. The Dakota Formation Sign was awarded following the Air Despatch role in ‘Operation Market Garden’ at Arnhem in September 1944. Air Despatchers suffered proportionally the highest casualties during the operation. The year 2000 saw the 100th anniversary of the formation 47 Company Army ServiceCorps. The first 47 Company was a Horse Transport Company. 47 Squadron Royal Logistic Corps is the direct descendant of that 47 Company. HQ 47 AD Sqn is currently stationed at RAF Brize Norton in Oxfortdshire.